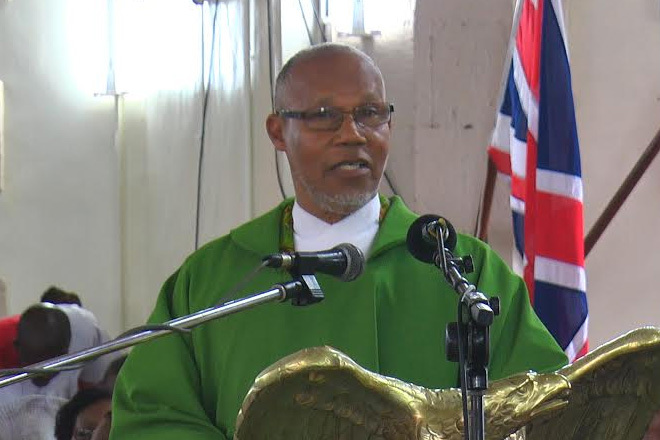 (ZIZ News) – On Sunday a special farewell service was held for Archdeacon Valentine Hodge of the Anglican Church, who will be leaving his post in St. Kitts Nevis later this week. The Governor General, government ministers and other invited guests were among the attendees. During his presentation to the congregation, Archdeacon Hodge thanked everyone who wished him well as he moves on to his next endeavour. “There have been many cards and calls and emails from many places. And so with this outpouring of love and affection it has been really rewarding, humiliating, at times with a loss of words, as much as I like to speak,” he said. He noted numerous projects that were accomplished in his parish and credited their success to the work of the congregation. “The refurbishment of the tower clock which is the benefit of the entire city, was done with your help. The refurbishment and reappoint of the residence at Taylors Range was done with your help. These are some of the outstanding things that have been done, there are many others but all of these show what we were able to accomplish as a parish together,” he said. Archdeacon Hodge will be leaving the island on Thursday and Father Dwayne Cassius has been recommended to take up his position.